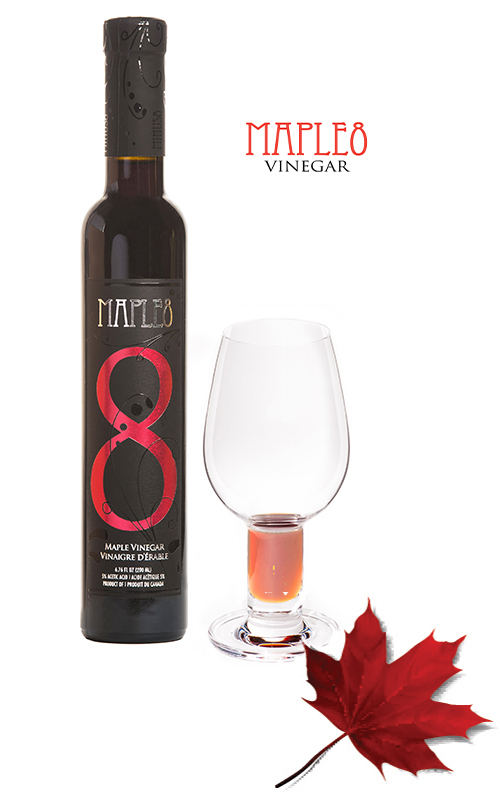 The finest quality maple syrup, from Quebec, was fermented and made into true maple vinegar. Naturally sweet, rounded with crisp acidity, a full palate of maple, oak, vanilla, and honey notes from aging in French oak barrels for over four years. Uses: Chefs will find many uses for this unique vinegar. We love using it in marinades for fish (think ceviche) and chicken, in glazed root vegetables, adding it to the liquid in the slow cooker, and in a BBQ sauce. Try a few drops of this over fresh grapefruit, or use it to balance icings or dessert preparations. Impressive sweet and sour entry follows by rich flavours of buckwheat honey, maple sugar, caramel, lemon curd, candied fruit and melon, with notes of white pineapple, dried citrus peel, mineral and spice. Crisp acidity tempers the natural sweetness and refreshes the palate on the finish.